The guidance ‘Supporting Pupils at School With Medical Conditions’ is issued under Section 100 of the Children and Families Act 2014 and places a duty on governing bodies of maintained schools to make arrangements for supporting pupils at their school with medical conditions. Other school policies, such as Child Protection, Equal Opportunities, Behaviour Management and Special Educational Needs. At Westgate Primary School, children with medical conditions, in terms of both physical and mental health, will be properly supported in school so that they can play a full and active role in school life, remain healthy and achieve their academic potential and that they can access and enjoy the same opportunities at school as any other child. A summary report for the school which will provide the school with information about the health needs of pupils, which can be used to inform our PSHE Curriculum and Pastoral Support. An individual report for each pupil, accessed only by the school nurse, to identify and address individual health needs. Information for Lancashire County Council to include in population health needs assessments and inform future provision for children and young people in Lancashire. 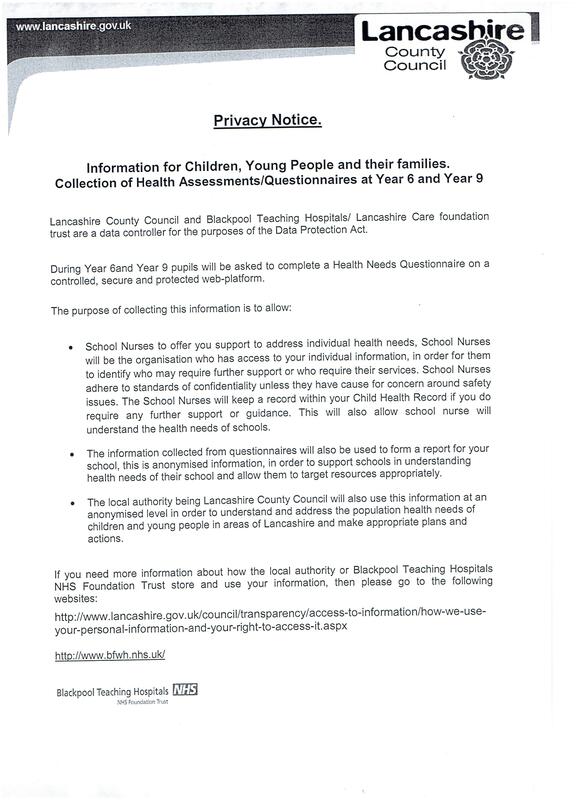 Only the School Nurse will be able to see the information on your child’s Health Needs Questionnaire. If the responses indicate that your child has a particular health issue, the School Nurse will contact your child individually. School DO NOT see your child’s individual information. If you are happy for your child to be part of the Health Needs Assessment Questionnaire, you do not need to do anything. If you do not want your child to take part, then please let school know. Children will not be made to take part if they do not want to.